Dean's Cards has just acquired a very rare Honus Wagner W600 Card. This card is currently for sale at DeansCards.com. The W600 Sporting Life Cabinets set is one of the largest early baseball card sets ever built and includes one very important piece of American baseball memorabilia. The W600 set consists of an unknown number of 5” by 7 1/2” cabinet cards organized alphabetically by player last name. There is no definitive answer as to exactly how many cards are in this set, but estimates range from 450 to 650. These cards were printed over a 9 year period from 1902 to 1911 by the Sporting Life Publishing Company located in Philadelphia. The Sporting Life Publishing Company printed The Sporting Life Newspaper, which ran from 1883 to 1917 and then again from 1922 to 1924. The W600 cabinets could be redeemed directly from The Sporting Life Publishing Company for three two-cent stamps and a Sporting Life coupon or could be bought for $0.10 each. The photos for these cards were taken by baseball photographer Carl Horner. The frame around each photo could have one of four different Sporting Life logos: a flower and leaf design, crossed bats and balls with the phrase “compliments of”, the crossed bats and ball logo without the “compliments of” phrase, or a light embossed Sporting Life advertisement. In the W600 set, Honus Wagner had two cards. One card, released in 1902, shows Wagner in his street clothes. The other card from 1905 shows Wagner in his Pirates uniform. Although the street clothes card has fewer existing examples, the 1905 uniform card is in higher demand. At the time that W600 set was being printed, Honus Wagner was one of the most successful and popular players in baseball. 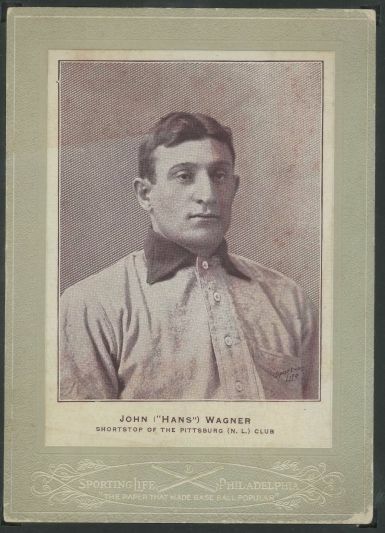 Despite the fact that Wagner’s entire career was played in the “dead ball era”, he was known for his impressive hitting prowess. Unbelievably, he was the National League batting champion eight times in eleven years between 1900 and 1911 and finished his career with a lifetime batting average of 0.327. The Pirates team in the early part of the century also found success behind their star shortstop. They won the NL pennant in 1903 and then beat the Tigers in 1909 to win the World Series. Wagner retired in 1917 and was inducted to the Hall of Fame in 1936 as one of its first five members. Wagner’s W600 cabinet is one of the rarest cards ever to be sold on DeansCards.com and we hope that you enjoy our take on this unique card.